Transporting humankind into internet age with complete internet infrastructure, online support and global exposure is the new vocation, open to everyone. You create a complete ecosystem from home to homepage by following a simple routine of cleaning your space, making your meals, programming your world and blog only public interest. This new routine makes you a new humankind and you inspire everybody else as well by transporting humankind into internet age with complete internet infrastructure, online support and global exposure. This new vocation is open to everyone. Sangkrit leads you into that. 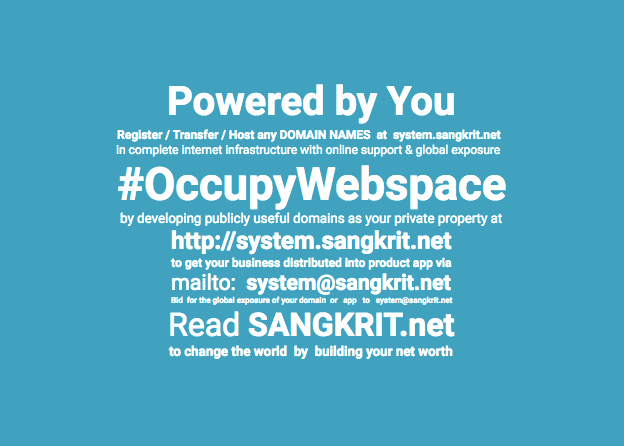 Simply signup for your free SANGKRIT.net account to startup now. As new humankind, your children deserve a new education. Practicing a programming language for developing your domain, is the core curriculum with everything else. Developing private properties of public importance as top level domains, builds the new civilization. Domain is the new private property whereas code under GPL is the new public property. At SANGKRIT.net people build own net worth for changing the world. Transporting humankind into internet age with complete internet infrastructure, online support and global exposure is the new vocation, open to everyone. You already know about popular BP Profile as Homepage plugin that simply redirects logged in BuddyPress users to their profile page and forces them to be there even if they try to move to HomePage, just like Facebook. This tutorial is on a new BuddyPress plugin Home Page To BP Profile + Privacy that redirects logged in users from home to profile plus it also adds post & page privacy features. You can make your home page more classified by displaying your recent blog posts from each or selected category on homepage by using Shortcode. Recent Posts From Each Category is a free WordPress plugin that provides you shortcode to display recent posts from all or selected categories in box layout on your WordPress site’s homepage. In last tutorial we discussed about hiding selected categories from specific user role types. Now this tutorial explains you different ways of hiding and limiting category display in your website.